Picture-Directory.com - The best choice for printable membership directories! Is designed to create printable membership directories with or without pictures. Is a PIM or Personal Information Manager Program. Runs on Microsoft Windows® 95,98, Me, NT 4.0, 2000, XP, Vista, Windows 7, and Windows 8. $59.95 one time charge. $16.95 annual license fee. 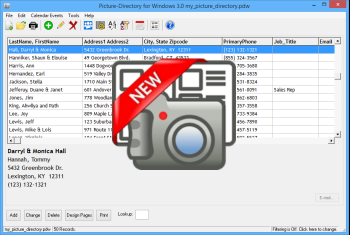 Picture-Directory for Windows™ replaces GEFC Directory™ 2.2 with provides an Improved Look and Feel, Custom Fields, Directory Display Sort and Filter Options, Improved Help, More Intuitive Workflow, Import directly from and Excel Spreadsheet and many other enhancements.